The other day I did a post on gallery walls here. And today I'm showing you one completed gallery wall in my living room. (Can I get a whoop, whoop?) It's located above the couch and is on the orderly/symmetrical side. This is the inspiration set of bird prints that I based mine off of. I love the natural look to them. They have a linen mat and were sold through Clayton Gray Home for $260 for the set. Aren't they lovely? I thought I could reproduce them in my own way since I didn't have 260 clams to shell out. So here is my take on those prints. Mitch graciously hanged them for me. See, I come up with the ideas and Mitch carries them out. There's no way I would have been able to measure out all those frames precisely. I don't have the patience for that. Thank God opposites attract! 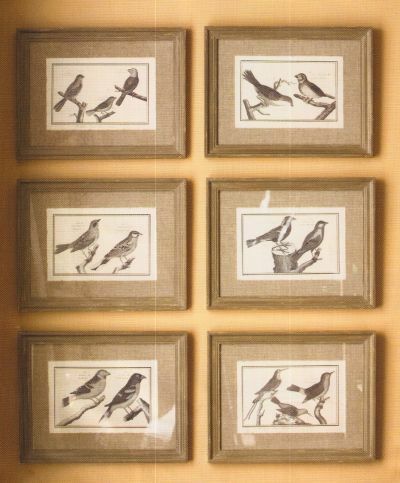 And here's the breakdown: The bird prints I got at a thrift store for $1 each. The frames I got at The Dollar Tree for...yep, $1 each. We used Command Strips to hang them since the original cardboard piece on the back of the frame wouldn't have lasted very long. We got the Command strips at Goodwill for $1/pack. We used one and a half packs. And the fabric backing I had left over from this project. So all in all, I spent $14 on six pieces of art that I totally love. It turned out beautiful, I love the bird prints you picked up. Ok those are awesome! I can't believe the great deal you got on all the frames/art. My fav part may be the backing. It looks so custom! I don't hang things either. I am not a perfectionist so it would be all wonky, this is where Eric steps in! BRAVO. Very professional and lovely. They are beautiful. Are they prints James John Audubon? They look like his work.